When I travel, seldom do I touch upon a people's soil without pondering the ancestors who arduously worked in this place where I have come to seek earthly beauty and business. I enjoy delving into the soul core of those who laid the foundation for the culture and Spirit of their descendants. My desire to delve into the history and culture of the Bahamas was assuaged by going to Dr. Gail Saunders--her books, that is. Director of the Bahamas' Department of Archives, Dr. Saunders has done much to enrich those archives, as she has written prolifically and passionately about Bahamian history and culture. The two books depicted here are just a drop in the literary bucket, as she has penned numerous others. I chose these two titles due to my interest in the triumphant spirit and contributions of enslaved global Africans. Bahamian Loyalists... tells the story of not only the arrival and impact of the early American settlers, but even more so of the influence of their Black slaves on the social, religious, and cultural life. Social Life... explores the labour and leisure lifestyles of the ex-slaves and their descendants, including education, housing, health, and spiritual life. One of the Bahamas' most outstanding historians, Dr. Saunders has contributed in immense ways to her homeland and to the recording of its people's lives throughout the centuries. When I visit Nassau, I love to bless myself with yet another of her books in order to become further educated and illuminated on the island history and culture. I read and reread them frequently. When you've visited the Bahamas so often that you have to check your passport to count the times, Bahamians smilingly remark, "You're not a tourist. You're another Bahamian." Patricia Roker, hailing from upstate New York, has lived in and served the Bahamas for so many years that she appears as Bahamian as conch stew and johnycake. She has, in addition, contributed to the Bahamas in valuable ways through a literary preservation of the history and culture, particularly in two notable works on brilliant contributors to the island's political scene, a compilation of the speeches of Sir Lynden Pindling, the Bahamas first Black prime minister during its post-independence years, and a fascinating biography of the former governor general, Sir Clifford Darling who was also president and a pioneer guiding force in the Bahamas Taxi Cab Union. Entitled Sir Clifford Darling - A Bahamian Life Story--Vol. I: The Years of Struggle l922-1958, the latter voluminous work guides the reader on the enthralling pathway of an enterprising contributor who is "walking history". The account of his youth in Acklins, Bahamas gives one a bird's eye view of early rural life in the smaller Family Islands and proceeds onward to his migration to Nassau and subsequent bout with segregation in the American South while working there as a contract laborer. From an empathetic champion of labor, one gets a firsthand account of l942 Burma Road "Riot", triggered by racial injustice by outside corporations in the building of the Nassau International Airport. The work shows the unfolding of Sir Darling's role in the development of the Bahamas Taxi Cab Union and his leadership in a strike that had immense historical impact on the country. This type of documentation could easily be dry and literarily listless; however, this work is as lively and entertaining as it is informative and inspirational. Sir Clifford Darling's life contributions have aptly earned him the title of "freedom fighter". Roker's painstaking recording of such Bahamian freedom fighters' lives have, in turn, earned her a well-deserved place of honor as a new millenium griot passing on the knowledge of the country's hard-won freedom. I purchased the Sir Darling book on a previous visit to Nassau. My next glimpse of island history will come through adding the book of Sir Lynden Pindling's speeches to my Bahamian literature collection. Bahamian people in general and Bahamian sacred sisters in particular are quite spiritually-oriented. They tend to have deep, resilient spirits that bounce back well from adversity and that render appreciation to the Creator during prosperous times. In essence, they know where they divinely come from and rarely forget their celestial roots. 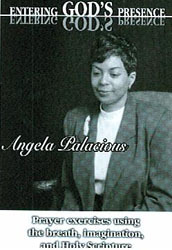 Angela C. Bosfield Palacious has taken this devotional Spirit a step further in her soothing motivational audiotape, Entering God's Presence. Her voice is as peace-promoting as a balmy breeze on a Bahamian seashore at sunset and thus the tape facilely promotes introspection and emotional healing. The tape leads one on a path of deep meditation and prayer utilizing imagery, focus on the breath and concentration on varied scriptures. Entering God's Presence is a positive addition to inspirational aids geared to promote healing and peace in the world and in the minds and souls of humanity. Ironically, while just writing about this audiotape, it just struck me to do a search on Rev. Palacious here on the 'Net. I was pleasantly surprised to find that she has just recently made history by becoming the first female Anglican deacon, having been ordained there in the Bahamas by Bishop Drexel Gomez in a televised ceremony. Congratulations, most sacred sister! Her husband, Father James Palacious, is the rector of St Matthew's Church there in Nassau. One afternoon as I was headed back to New York from Nassau, I browsed the shelves of the Bahamas Newsstand there in the airport to see if I could find a copy of the Nassau Tribune, Bahamas Journal, the Punch ("variety is the spice of life! "), and the Nassau Guardian newspapers to read during the flight period. While there, I had the pleasure of meeting a wonderful Bahamian sacred sis there, "Miriam like in the Bible" with whom I had a brief but delightful chat. Another delight besides meeting the wonderful Miriam like in the Bible was finding the book, Bahamian Psychologically Speaking--Attitudes and Cultural Patterns in the Bahamas.. I found myself saving the newspapers to read when I got home and immediately delving into this book by Mizpah C. Tertullien which delves into the Bahamian psyche on topics ranging from the importance of the home in the development of Bahamian youth to sections on romance and marriage to the Bahamian woman's impact on her society. While she writes of the strengths of the society, she also candidly discusses the human flaws of infidelities and low self esteem. The work shows the pressures and conflicts faced by different members of the Bahamian population as well as their positive traits. Commendably, it points out the inherent longing of the youth for direction and meaningful training and work and the importance of the prioritizing and providing of this for the well-being of the entire society. She went out and talked with the youth on the street, ("the boys on the block", as she terms it) to elicit their opinions--the type of youth that many fear and cross the street to avoid, she found had great ideas for the improvement of their country and their own private lives, if they could just get the necessary assistance to make a change and financially provide in positive ways for themselves and their families. In suspicion, some refused to talk with her, but others opened their hearts in very touching, thought-provoking ways. I was also impressed with the author's discussion of the need for a positive release of suppressed tension by males through crying when need be instead of dangerous exploding (and imploding). This is something I'd often discussed over the years with my high school students, particularly males vulnerable to violence. In order to survive, I'd counseled them, learn to pray and cry, when necessary. This can be done privately, but it is a healthy release of built-up tension and stress, no matter what society has put in your mind. This Bahamian psychologist mentions that both females and males have tear ducts and that they are in the body for a reason--for use by both genders. Well trained in both the field of nursing and psychology, Mizpah Tertullien, a well-traveled Bahamian woman contributor, has apparently dedicated her life and her talents to motivating her people and to promoting sociological and spiritual concepts for a better society. Her work bears reading but most significantly--heeding. One might wonder why I would include a singer on this page of illustrious Bahamian women writers, even a singer of the popularity and talented stature of Sweet Emily, "Queen of Junkanoo." Well, we frequently forget that singers are oftentimes among our most gifted writers. Beloved Bahamian entertainer, Emily Austin, is no exception. 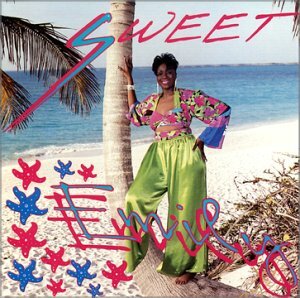 The work chosen for inclusion on her Sweet Emily - Queen of Junkanoo cd and tape not only project the rhythm and flavor of her island homeland but span a wide range of song stories from the lively spirited Junkanoo Queen to the soft and sentimental Island Lullaby to the poignant "Nobody's Child". Many were penned by noted musician/producer, Fred Ferguson, but Sweet Emily also blesses her listening audience with a couple of her own creations. In addition to Lil Bit, a fun piece about addiction to musical rhythms and the power of Junkanoo, she has also written, In My Heart a song of unconditional love worthy of accompanying wedding vows or of melodically voicing love praise to the Creator. Wow! I just looked at the insert in the Sweet Emily audiotape and here in her own words she verifies that this is indeed a love song dedicated to God: "Most of all,I thank you God for giving me such a talent, and I dedicate the song, "In My Heart", to you--because you are the reason why I sing." Another profoundly warm-hearted treasure of talent who has justly and spiritually earned her nation's musical adoration. In Bahamian Cultural Dynasty, Donna, a prominent Bahamian entrepreneur and poet, records the cultural life of her ground-breaking cultural parents, the Hon. John A "Chippie" Chipman, fondly known as the "grandfather of Junkanoo", and the late Rebecca ("Queen Becky") Chipman, who was the Bahamas' first female fire dancer. The work contains numerous historical pictures of the dynamic couple and their descendants, most of whom are also "chips" off the cultural block, also distinguishing themselves in the arts and business. The book also guides one step by step in making a Goombay drum, a skill for which Mr. Chipman is famed. Donna is a multifaceted young Bahamian entrepreneur, as she is not only a poet, family historian, and publisher, but she has also carried forward the family tradition of fire dancing and is now the proprietor of the Atlantean Massage Therapy facility at the Nassau Beach Hotel where one can pamper one's self with ultimate island relaxation and healing at the soothing master hands of Reiki specialists. Now that's really something to provide smile-promoting, island vacation memories. Most importantly, the greatest sign of a life master is how one reveres and celebrates the contributions of those who have sacrificially laid an ancestral foundation, beginning with one's family members and expanding outward to love promoters throughout the planet. Donna is to be commended for documenting the cultural breakthroughs and achievements of one of the Bahamas most prominent culture-lifting families and not only that, she depicts through text and photographs how to actually make the great goombay drums for which her father is famed. I was so proud to be able to purchase one of Mr. Chipman's goombay drums bedecked with artwork by his grandson, award-winning dancer/visual artist, Metellus Chipman. I was introduced to this skilled work by reading and rereading Bahamian Cultural Dynasty, a wonderful literary monument to a great Bahamian cultural family. If you're familiar with the Bahamas' powerful ancestral festival, Junkanoo, then you're more than likely acquainted with the work and contributions of Arlene Nash Ferguson, one of the world's top female Junkanoo performers, proponents, and educators. I Come To Get Me stands out among Junkanoo publications in that it takes the reader, graphically and textually, on a colorful, behind-the-scenes literary tour of the Junkanoo world and into the minds and hearts of dedicated Junkanooers. The cover shows how a masterpiece is birthed from humble cardboard, and outstanding illustrations and photography of the artwork and dedicated lives of Junkanooers are presented on each page. In addition, although Ferguson, a long-time One Family Junkanoo member, is a respected Junkanoo historian, the work is not penned in a dry, pedantic way, but in the down-to-earth, enthusiastic Spirit of one who is a long-time lover of Junkanoo and all that it represents ancestrally. As a Junkanoo admirer, this work is ever close at hand, both at home and in my travels; it, in fact, sits in a place of honor just behind Chippie's goombay drum in the Junkanoo exhibit in my foyer. I Come to Get Me escorts you to the inner depths of the Spiritheart of Junkanoo. The artistic layout of the work is phenomenal and eminently eye-catching from start to finish. The Burnside brothers, Stan and Jackson III, who are famed Junkanoo artists and promoters, are to be commended along with the other staff of this literary project for artistically birthing such a mighty contribution to Junkanoo literature. (Some of their visual work on Junkanoo can be seen at Doongalik Studios on Village Road in Nassau). Each page of the book speaks eloquently of the long hours of arduous work that evidently went into its creation . Its talented author, Arlene, and her husband, Junkanoo costume designer, Silbert Ferguson, are contemporary historymakers in terms of their artistic and entrepreneurial contributions to Junkanoo. Their Educulture enterprise introduces world visitors to Junkanoo art and culture and educates Bahamian youth to the glory and honor of their ancestral culture. There is always yet another cultural reason to visit the Bahamas and beholding the Fergusons' Junkanoo Museum is a definite must-do. (By the way, one can get information about the museum and arrange for tours by calling: 242-328-DRUM.) Whenever I think of Arlene and her work, the words, "Junkanoo Queen on the Bahamian cultural scene" just naturally come to mind. I never tire of reading her work or gazing at the fabulous Junkanoo photography and art. As a culturalist, it's difficult not to fall in love with the power of Junkanoo at first sight. Perceiving how Junkanoo constantly celebrates and uplifts the ancestry which birthed it, I longed to know what makes it tick ancestrally. JUNKANOO - Festival of The Bahamas promptly came into my life as an answer to that cultural prayer. The work takes one to the roots of Junkanoo and its evolvement. Beginning with an overview of the islands, history, and people, Junkanoo... carries one forward from the days when the slaves celebrated their respite from labor by making a lengthy joyous noise throughout the island with homemade instruments and costumes of sponges and newspaper, a humble precursor to the highly organized, intricately designed, and supremely costly extravaganza called Junkanoo today. The work also shows how Junkanoo was interwoven with politics and mass protest at varied times in Bahamian history as well as its kinship to similar festivals in other worldspots populated by descendants of West Africa. It contains a number of soulful paintings of ole time Junkanoo, many of which are now in private art collections, including a number of creations by Brent Malone, a famed fine arts painter who has specialized in works on Junkanoo. The book, the brainchild of the late Bahamian ethnomusicologist, Dr. Clement Bethel, who served as Director of Culture and who began the work as a part of his master's thesis. Subsequent to his death, his daughter, Nicolette edited it,adding the closing chapters. It is a treasured work to possess by a reader endeared to Junkanoo and interested in the African roots of Bahamian culture. Following in the footsteps of her sister predecessors, Zora Neale Hurston and Katherine Dunham, Dr. Rosalyn Howard delved soul, mind, and body into the lifestyle and culture of an ancestrally-connected island people to share with posterity. An assistant professor of anthropology at the University of Central Florida, Dr. Howard's work, Black Seminoles in the Bahamas, should serve well not only the history classes in the United States but also those of the Bahamas. Over the years I'd read numerous works on the Seminole-African-American linkages, notably those by Dr. William Loren Katz, which revealed the Seminoles' hospitality and deep bonding with freedom-seeking ex-slaves from South Carolina and Georgia. These works showed how the fugitive slaves and their descendants became some of the most valuable tribal members, serving as farmers, translators, and highly skilled warriors. Then through reading Bahamian history and books from friends who'd traveled to Florida, I learned of the Black Seminoles who maintained their liberty against the constant incursions of the slaveholders and supporting by migrating to the Bahamas in l821. This work rounds out the story by bringing one up-to-date on the outcome on that historic relocation to both another culture and country. One meets the present-day descendants of those courageous tropical pioneers and get glimpses not only of their contemporary social, cultural, and political lifestyles, but of the historical contributions of their ancestors to the Bahamas. Ironically, news of this work reached me just as I had completed a lengthy curriculum on Underground Railroad contributors. The work illustrates how an important segment of Underground Railroad "assistants" has been too frequently ignored--that of empathetic Native Americans and Black Indians like those who were a part of Seminole society in Florida. It took me months to complete the writing of the curriculum for the online Underground Railroad course. Yet there is something more I really must add now--the addition of Black Seminoles in the Bahamas to the recommended readings list. Our own people were powerful supporters and contributors to the Underground Railroad to freedom, and this work helps to show how both the freedom quest and the African Indian influence were expanded to a global level. I was also pleasantly surprised to find mention in this work of a Black Seminole descendant and contributor to Red Bays, Andros, who is a kinsperson to a family in Nassau who initially introduced me to Junkanoo. The work mentions Rev. Bertram A. Newton, a pioneer educator and minister in Andros. Rev. 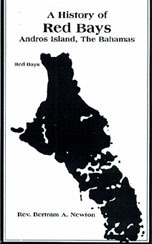 Newton penned the booklet, A History of Red Bays, Andros Island, The Bahamas ,(depicted above), which was the first written account of the Black Indian presence in Andros. It turns out that Rev. Newton is the grandfather of the late Jacqueline Newton Baker, (honored on our home page, and Steve "Papa" Newton, the veteran Valley Junkanoo performer who introduced me to Junkanoo). This elder contributor has served his history well. I have a number of autographed books, but to have one with the signature of a descendant of those powerful Black Seminoles brings a slight smile to the face and a nice feeling to the culture-lifting heart. You know, sometimes one of the main reasons I want to get back to the Bahamas is to enjoy some of that supremely tasty food again! After unpacking my bags, the first thing I do at times is to walk down Bay Street to the Imperial Restaurant and get some cracked conch or up Junkanoo Beach to the Fish Fry (Arawak Cay) to get some conch salad, conch fritters, or scorched conch. Man, I just love it! Rarely do I visit Nassau without dropping by a local bookstore like the Island Bookshop to bring back home some of the literature of our gifted Bahamian sister and brother authors. Since I haven't found any Bahamian restaurant in the New York metro area (what a shame! ), I was delighted to find the two recipe books depicted above. Best Recipes of the Bahamas not only guides one in making some of those tasty Bahamian favorites, but the book in itself is a colorful feast for the eyes aesthetically. I often just thumb through it to remind me of the beauty of the island environment as well as its palate-pleasing food. The layout is well designed and beautifully executed. I'm a cultural consumer of history books, not recipe books, but I couldn't resist this one. Within its pages you'll find everything from curried lobster and pigeon pea soup with dumplings to johny cake and guava duff. Mmm! ("Some good eatin'", as my grandmama Anna Pearl would've said.) Yes, Bahamian sisters and brothers really know how to lay out a powerful plate, and this recipe book enables you to bring the "best of the Bahamas" to your own home table. I added Happy Cooking The Bahamian Way to my Bahamian literature collection because of its warm, homey style of sharing island cooking and because I was impressed with the initiative and skills of Ms. Sylvia Laramore Crawford's as a Bahamian woman author and publisher. This is a work that is well put together and quite worthy of support and encouragement. I travel to Nassau so frequently that it has become somewhat of a second home to me; so naturally I get lonesome for my adopted island home. During one of those missing-the-Bahamas periods, I made some johny cake to accompany an evening meal before immersing myself in a Junkanoo video. My first try at it wasn't quite what I'd get at my friends, the Newtons' home in Nassau, or at the Shoal Restaurant, but it was still fairly tasty for a Tennesseean turned New Yorker trying a quick hand at island cooking. Thanks to Ms. Larramore-Crawford, the second try took me up quite a few steps higher in the johny cake making ranks. From guiding you to gracing your platters with sumptuous cuisine ranging from smothered grouper and baked crabs to red cabbage salad and okra soup, Happy Cooking the Bahamian Way will help one to master setting a tempting and tasty table. And again, it is a treat to also financially encourage such a positive Bahamian publisher and author. I'll always keep and treasure this book, along with my prized collection of other works from the islands I've been blessed to both visit and love. BAHAMIAN CULTURAL DYNASTY, Book One - Donna L. M. Chipman. PMT Atlantean, PO Box SS-19197, Nassau, N.P., Bahamas, 2000. BAHAMIAN LOYALISTS AND THEIR SLAVES - Gail Saunders. MacMillan Education Ltd., London and Oxford, l983. BEST RECIPES OF THE BAHAMAS - Lucy Hanley, Editor. Keepsake Cuisine Series. John Hinde Curteich, Inc. Westlake Village, CA. HAPPY COOKING THE BAHAMIAN WAY - Sylvia Laramore-Crawford. PO Box N-4709, Nassau, Bahamas, l994. 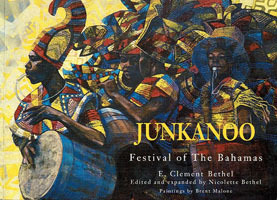 JUNKANOO - Festival of The Bahamas - E. Clement Bethel. Edited and expanded by Nicolette Bethel. MacMillan Education Ltd, London, 1991. 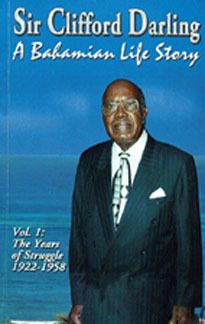 SIR CLIFFORD DARLING - A Bahamian Life Story, Vol. I: The Years of Struggle, 1922-1958 - as told to Patricia Beardsley Roker. Sir Clifford Darling, Publisher. PO Box N-1050, Nassau, NP, The Bahamas, 2002. SOCIAL LIFE IN THE BAHAMAS 1880's-1920's - Gail Saunders. Rosebud Ltd, PO Box N-4805, Nassau, Bahamas, l996.